“James F. Drigger’s farmhouse. Coffee County, Alabama,” August 1941, by John Collier, via Library of Congress Prints and Photographs Division. This photo was taken in the same county as yesterday’s farmhouse with quilts. I think those are papaya plants in front of the porch vines and in the lower left corner. Nope, they’re Ricinus communis or castor beans. Thanks Melissa! They and the flowers make a nice approach to the lined-up front and back doors. 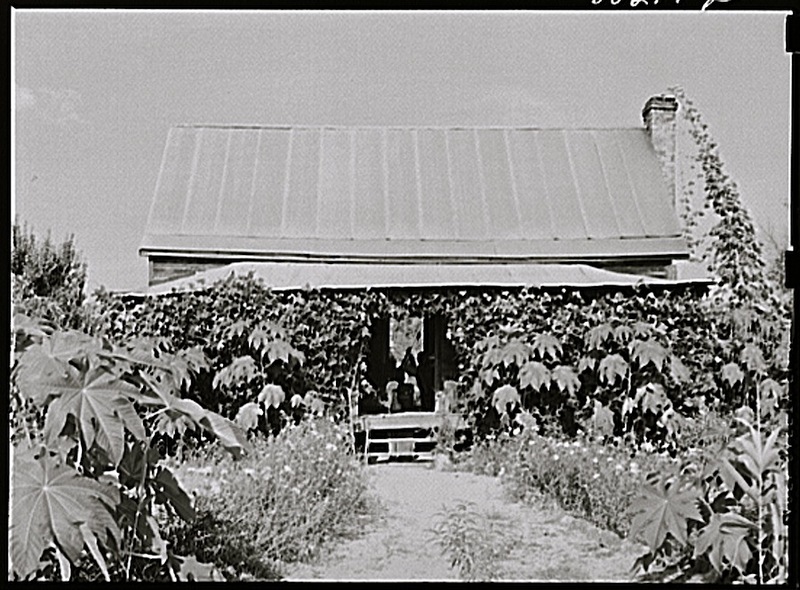 John Collier was working for the Farm Security Administration when he took this photo. The Drigger family was receiving assistance to raise chickens under the “Food for Defense” program. Certainly they would enjoy the Alabama climate. Oh, you’re right, I’m sure. I forgot about castor beans. Imagine that scene in person; aren’t castor beans reddish-purple?